I've long been looking for light, moist veggie burger; something that wasn't simply dense beans or all textured vegetable protein. This is delicious and not what I expected to find at all. 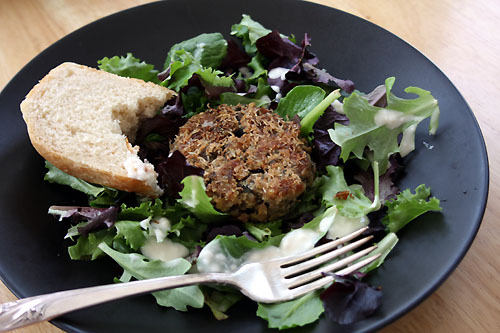 While you could bill this as a burger, it's more of a cake; like a crab cake or salmon cake, but made with mushrooms. They make excellent sandwiches or served them over some fresh greens with a simple dressing made of mayo thinned with some lemon juice. Since discovering this recipe we've made mushroom burgers the last three weeks in a row. It's that good. We've tried various combinations, but I can't really tell the difference between different mushrooms. So I've been sticking with the button mushrooms because they are less expensive. Saute the mushrooms, onion and garlic for five minutes or until soft. Mix the sauted mixture with the oats, parmesan, egg and seasonings. Add the breadcrumbs until you get a mixture that makes a clumpy texture. This post was featured on Simple Live Thursday. These burgers looks really moist and delicious, they held together too!! I am growing some veg in pots on my roof terrace but having mixed luck. The fennel looks great I will be harvesting this week but my rocket keeps turning purple, any ideas?! Great blog, Foy! 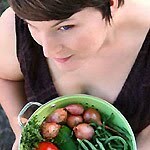 Please consider teaching a sustenance gardening class at Taltree. Also, any suggestions for where I might acquire witch hazel seedlings/sapling for my Harry Potter garden? I have the urge to put it on a bun with a nice slice of tomato, lettuce and onion. Looks yum! What kind of mushrooms did you use? These burgers look awesome and so healthy too! This looks delicious and healthy at the same time. I would love to try this one. This sounds great! I bet the light texture is just fantastic on greens! I know what's going on my menu for next week - awesome! I love mushrooms and usually that means a big portobello grilled and put on a bun. This recipe sounds like a refreshing alternative. I've bookmarked this and can't wait to try it soon! This mushroom burgers will be a great trick to toddlers. They'll be eating their favorite food in a healthy way. Looks fantastic! Love your tasty photos!! I would not mind eating that burger day in and day out...it sounds sooo good! 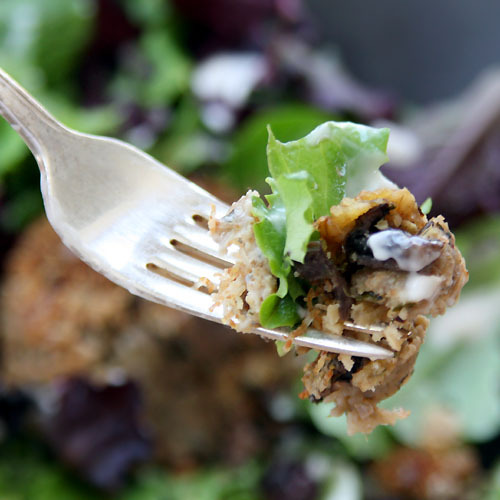 i don't normally like mushrooms, but i LOVE veggie burgers, and will definitely try this. I've never thought to put a patty on top of a salad, but it makes a me. my stomach's excited. @Clarissa - Yes they do get a nice crunch if you put enough oil in the pan. The last time I made them I dredged them in bread crumbs right before. Delish! I never thought of using oats- these look great! Oh my this would be a great lent recipe. Would you mind if I linked my site to your recipe? I am eating one of these now! Thanks for having a great veggie recipe to use up my mushrooms. look great! i love mushrooms. Whewn we have mushroom burgres, it's a grilled portobella mushroom, with balsamic vinegar. Next time well have to try your recipe. Soumds delicious. I definitely can tell the difference between mushrooms. Some are more meaty in flavor and texture. Some are more delicate. I would make these with shiitake mushrooms or creminis. I can find both of them pretty reasonably. Button mushrooms have no flavor to me. I normally take a box of them, add in some hydrated dried porcini, which have an amazing scent and flavor, and then cook them together. Ooh these look yummy! As a committed carnivore I really am not a fan of veggie foods with 'fake' meat (TVP etc), but much prefer meals that just happen not to have meat - like these delicious sounding burgers! Mmmm~ mushroom burgers. And since mushrooms soak up flavors, you could use beef broth to emulate the taste of the usual burgers. This is also a fine addition to your grill party, especially if you have vegetarian friends coming by and are at loss on what to prepare.